NEW: President Obama says U.S., Saudi Arabia "have a long history of friendship"
RIYADH, Saudi Arabia (CNN) -- President Obama, on the first leg of a Mideast trip, said Wednesday that he is confident the United States and Saudi Arabia can "make progress on a whole host of issues of mutual interest." 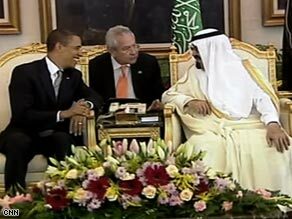 President Obama meets with Saudi King Abdullah on Wednesday in Riyadh, Saudi Arabia. Shortly after his arrival Wednesday in Saudi Arabia, Obama and King Abdullah went to the Saudi ruler's farm for a welcoming reception. The two leaders met privately afterward. Obama leaves late Wednesday for Cairo, Egypt, where he is to address a mostly Muslim audience Thursday (6 a.m. ET). His plans to improve America's image among Muslims have been in the works since his first week in office. iReport.com: How can U.S. better relate to Muslims? "My job is to communicate the fact that the United States has a stake in the well-being of the Muslim world, that the language we use has to be a language of respect," Obama said in a January interview with Al-Arabiya television network. Analysis: Does Obama diplomacy work? "I have Muslim members of my family. I have lived in Muslim countries." When the White House announced the Mideast trip in May, spokesman Robert Gibbs described Egypt as "a country that in many ways represents the heart of the Arab world." Gibbs deflected questions at his daily briefing about whether Egypt was a wise choice, given President Hosni Mubarak's resistance to making his government more democratic. CNN's Ben Wedeman, who talked to Egyptians in Cairo to gauge their sentiments, said most of the people were eagerly awaiting the president's visit but said some were concerned that Obama, by making Egypt the focus of his trip, could legitimize Mubarak's 28-year rule. These Egyptians said they feared Obama might not discuss with Mubarak long-sought problems such as the need for democracy and political reform. "What they want is results, not just words," Wedeman said. There were visible preparations for Obama's visit, he said. Many streets were repaved, and markets were selling T-shirts in his honor, with some reading: "Obama: New Tutankhamen of the World." In April, Obama chose Turkey, a more secular state, as the site of his first presidential speech to a Muslim majority nation. He told the Turkish legislature in Ankara that the "United States is not and will never be at war with Islam." Former U.S. Secretary of State Madeleine Albright pointed to a common theme among the many conferences she has attended with Muslim speakers: "When the Cold War ended, America needed an enemy to replace Communism and chose Islam." In an op-ed Tuesday in The New York Times, Albright wrote, "How else, they ask, to explain the two Gulf wars, Afghanistan, Guantánamo and the plight of the Palestinians? "To support their thesis, they cite the bellicose post-9/11 rhetoric of U.S. officials, the Western media's preoccupation with Muslim extremists and the plethora of pundits who have identified Islam, especially 'political Islam,' as the leading threat to civilization in the 21st century." iReport: Are you concerned about the way Muslims have been portrayed in recent years? Albright said, "To most Americans, the idea that our country is attacking Islam or that we view the Islamic faith as an enemy is absurd." She pointed out that in the 1990s, the U.S. twice led NATO into conflicts on behalf of Muslim populations -- first in Bosnia, then in Kosovo. Not long before Obama departed on his trip, a CNN/Opinion Research Corp. survey suggested that more than two in five Americans, or 46 percent, have an unfavorable opinion of Muslim countries. That view is an increase of 5 percentage points from 2002. Three in 10 Americans questioned said they had a neutral opinion. On Tuesday, Gibbs told reporters: "I think what is important is that we demonstrate that the United States wants to pursue a different relationship and ensure that Muslims around the world understand the message of the United States." He said, "We have more in common than we have disagreement about, and I think that's what he wants to ensure that the vast majority of the Muslim world hears." Mideast expert Mamoun Fandy agrees with Egyptians who say Muslims want more than talk; they want action. They want to hear "that he is very serious about solving the Israeli-Arabian problem, that he is very serious about engaging the Muslim world on the basis of recognizing the equality," Fandy said. After Egypt, Obama will visit the remains of the Buchenwald concentration camp in Dresden, Germany, on Friday. He then is scheduled to take part in D-Day ceremonies commemorating the 65th anniversary of the World War II Allied landings in Normandy, France.